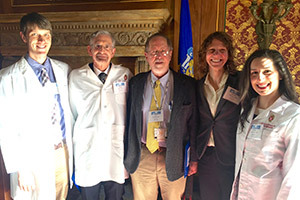 UW Department of Family Medicine and Community Health (DFMCH) faculty and residents were among the over 300 physicians from around Wisconsin who visited the State Capitol on February 10, 2016, to participate in Doctor Day 2016. DFMCH participants in Doctor Day 2016, from left: Madison residency program graduate Aistis Tumas, MD; faculty David Deci, MD; faculty John Beasley, MD; resident Jennifer Perkins, MD; resident Allison Couture, DO. The event—organized by the Wisconsin Medical Society, with support from 17 state medical specialty societies, the UW School of Medicine and Public Health and the Medical College of Wisconsin—brings physicians together to advocate on behalf of patients and the medical profession. Assembly Bill 549, which would authorize physical therapists to order x-rays for patients outside a hospital setting or without the supervision of a physician. The DFMCH’s David Deci, MD, then introduced Tim Hoven, who spoke about the legislative process, barriers to effective advocacy and strategies for developing relationships with legislators. Following afternoon presentations from leaders of three Wisconsin medical specialty societies, participants then met in person with legislators to further discuss the issues presented earlier in the day. The day was also a valuable opportunity for learners wishing to engage in advocacy efforts. DFMCH resident Alison Couture, DO, who attended the event and who has had experience with national legislative advocacy, emphasized that individuals can collaborate with society policy and advocacy teams in addition to, or instead of, meeting one-on-one with legislators.